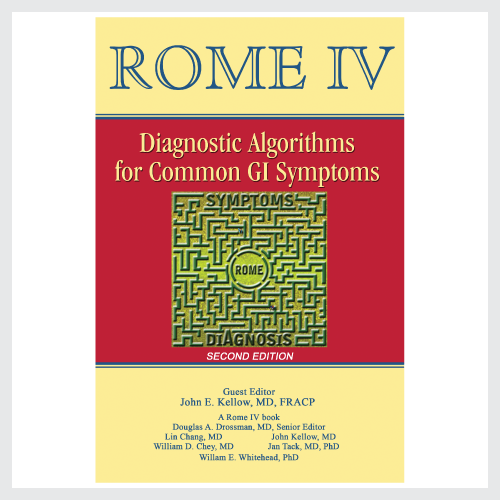 View cart “Rome IV Diagnostic Algorithms for Common GI Symptoms (Second Edition)” has been added to your cart. This book, guest edited by William Whitehead, PhD, provides, in one compact volume, all that is needed for researchers and clinicians to perform studies in English-speaking countries. 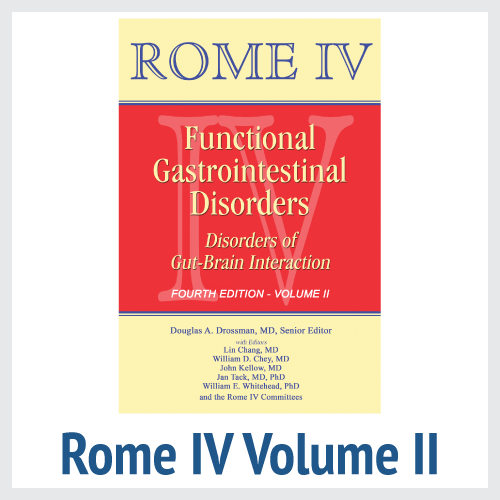 The Rome Foundation maintains a major commitment to the creation and dissemination of good research in the field of FGIDs. To properly study patients having these disorders we need to identify them in as precise a way as possible. Hence, we have proposed, created and disseminated the use of diagnostic criteria and questionnaires for epidemiological and clinical research. As such the Rome criteria have been recommended by the U.S. FDA, the EMA and other regulatory agencies for clinical trials, and they remain the only method used to diagnose patients by epidemiological surveys. 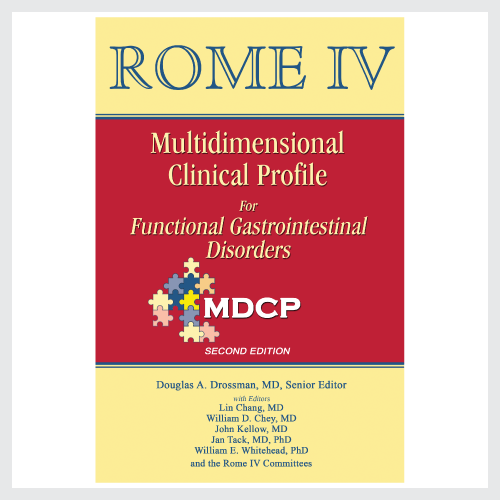 To maintain this initiative for Rome IV, we developed an extensive multinational program to first create the Rome criteria through our Rome IV chapter committees, and, in addition, validate and also translate the questionnaires containing these criteria research. We have done this not only for adults but also adolescents and young children. This book, guest edited by William Whitehead, PhD, provides, in one compact volume, all that is needed for researchers and clinicians to perform studies in English-speaking countries. 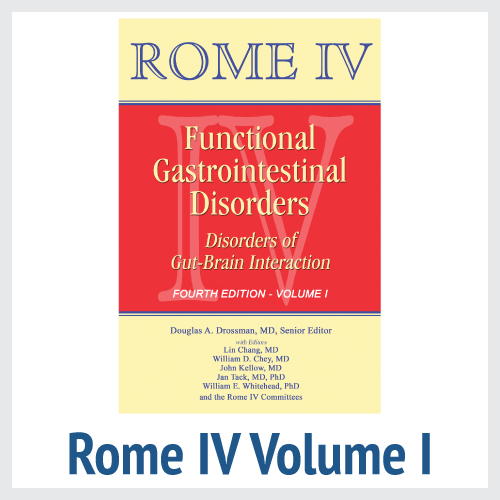 The book begins with an introduction by Dr. Whitehead, follows with chapters about FGIDs and the Rome IV process, and then contains a chapter on the development and validation of the Rome IV questionnaires. 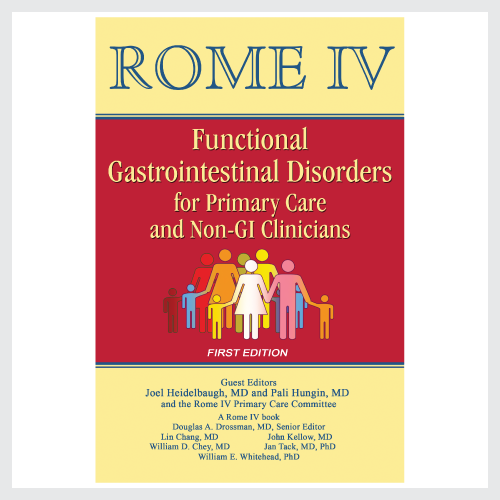 The second section is the heart of the book: 1) the diagnostic questionnaires for adult functional GI disorders, 2) the psychosocial alarm questions for FGIDs to help clinicians decide when to refer patients for mental health treatment, and 3) the diagnostic questionnaires for pediatric FGIDs with questionnaire sets for children and adolescents as well as neonates and toddlers. 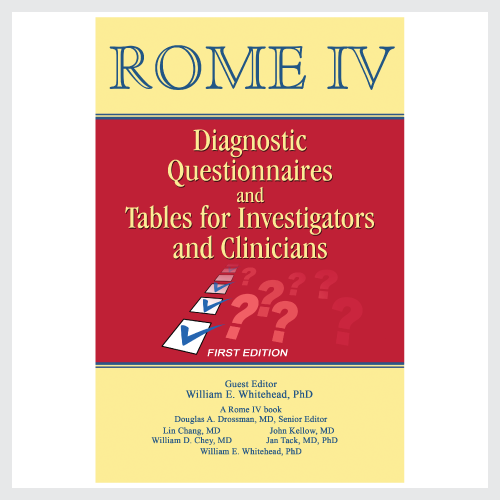 Finally the appendices provide supplemental information including a reference table of all the Rome IV diagnostic criteria, a comparison table between Rome III and Rome IV criteria for investigators who may have used Rome III in previous studies, and finally a psychosocial assessment flowchart created by the Biopsychosocial committee to guide clinicians in the biopsychosocial care of their patients.